NOTE: Except for weekends, The Dinner Party will be closed to the public April 1–May 2, 2019. 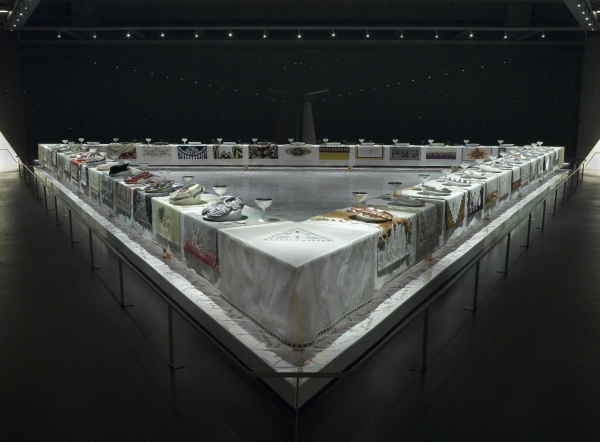 The Dinner Party, an important icon of 1970s feminist art and a milestone in twentieth-century art, is presented as the centerpiece around which the Elizabeth A. Sackler Center for Feminist Art is organized. 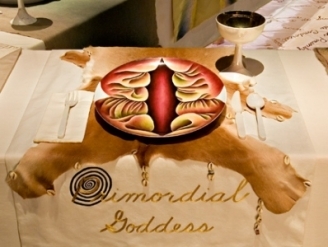 The Dinner Party comprises a massive ceremonial banquet, arranged on a triangular table with a total of thirty-nine place settings, each commemorating an important woman from history. The settings consist of embroidered runners, gold chalices and utensils, and china-painted porcelain plates with raised central motifs that are based on vulvar and butterfly forms and rendered in styles appropriate to the individual women being honored. The names of another 999 women are inscribed in gold on the white tile floor below the triangular table. This permanent installation is enhanced by rotating Herstory Gallery exhibitions relating to the 1,038 women honored at the table. Read about the components of The Dinner Party.